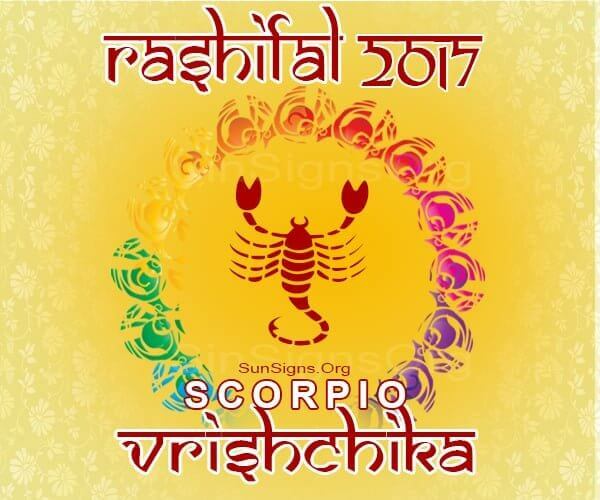 Vrischika Rashifal 2017 predicts you will have a promising and wonderful year. Challenges are part of the game. But you have the will power to overcome all obstacles that stand in your way in 2017. By nature Vrischika Rashi people can be overbearing and inflexible which will affect relations with other people. Travel for professional purposes as well as for holidaying with the family are very much on the cards in 2017. People pursuing studies should focus on their future career prospects and work out suitable plans. The scorpions should be diligent in whatever you do and success will definitely be yours. The Vrishchik 2017 Rashifal foretells that professionally you will prosper in your job. Planetary influences will help you to accomplish your goals in your career. The scorpions will be blessed with success in all aspects of their profession. Just be patient and your hard work will be rewarded well. You will take up new and difficult projects and will execute them successfully. If you are thinking of changing your job for better prospects, the year is auspicious and it may require change of place. New business ventures will prove to be successful. First six months of 2017 will be more challenging financially for the Vrischika Rasi with expenses exceeding earnings. The Rashifal astrology predictions for 2017 suggest that all financial projects should be taken up during the latter part of the year. And try to complete them this year itself if possible. There may not be enough money for investments this year and all expenses need regulation. The Varshik Vrischik Rasifal 2017 horoscope warns that it is important that you give enough space to your spouse this year. Spend more time at home if you want harmony in the family atmosphere with your parents and children. You should be more friendly and compromising if you want your love relationships to be smooth. Single Vrischika Rashi people will have many opportunities for marriage during the year. They should avoid conflicts with their partners if they want the relationships to continue. Be sure to discuss with your spouse before planning to have a baby. Sexual relations with your spouse might be strained. The Vrishchik 2017 Rashi predictions forecast that your health will be wonderful this year. All minor illnesses should be attended to promptly. Health can be further enhanced by taking enough breaks and going on holidays with family and friends. But health of some family members may cause some concern. Overall, the Vrischik 2017 Rashifal foretells a year of new experimentation, innovations and trials that can prove to be life changing.